As I was browsing through the book, Pioneer Women I ran across a page titled "A Home on Wheels" showing a family standing in front of their prairie schooner. It brought to mind how I call our fifth wheel trailer our "home on wheels". We recently returned from a birding trip around southeast Arizona and we felt like we had really gone back in time at one RV park with no cell phone service or TV. Then it occurred to me living in an RV would have seemed like heaven to pioneers traveling west. 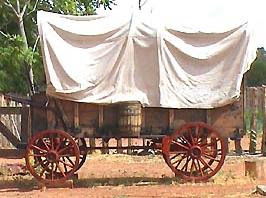 A covered wagon or prairie schooner used by pioneers measured about 10 feet long and 4 feet wide. --- Our trailer is about 30 feet long and 8 feet wide with slide outs to make the bedroom and living room bigger. Some prairie schooners had a false bottom to carry supplies. --- Our RV has storage under the floor plus many drawers and cupboards to carry supplies. Lists of non perishable food items to bring on the overland journey suggested pioneers include ample amounts of flour, sugar, bacon, dried fruit and rice. Starting with 5 barrels of flower you can imagine how much space all this took. --- We have a refrigerator that works on either gas or electricity and a grocery store is rarely more than an hour away. Pioneer women had to cook over an open fire. Some had a Dutch oven or a rare stove. --- I do most of my cooking in the microwave and sometimes light up the gas stove or oven. Roughing it is having my dear hubby barbecue on our little gas grill.